The Barn | Just Shooting Memories! I have been fortunate enough to shoot both Canon and Nikon over the past several years. I must say that I am impressed with both lines of cameras. Most recently, I have settled on the Nikon D90 and have been shooting with it for over six months. I must say, it is a very nice camera. It has good functionality and decent speed with the “kit” lens (18 – 105). Now, the bad. To operate a camera effectively, the ability to change settings with out removing your eye from the view finder is a must for me. Several of the button combinations to achieve some of my most used functions are awkward when trying to shoot. For example: I routinely use exposure compensation. To adjust the exposure compensation during shooting, you remove your finger from the shutter release and press the exposure compensation button just behind. Then rotate the rear dial with the right thumb. So, it takes two fingers from the same hand. A better placement for the exposure compensation button would have been where it could have been operated with the right hand and then the left thumb could rotate the dial. I have noticed a small amount of vignetting using the kit lens. Maybe this is just a DX format thing. However, it is easily fixed in Adobe Lightroom. Now, for the Good… This camera has been very rugged for me. Traveling with two children and moving it between vehicles, it has shown that it can with stand a lot. I have thrown this camera around, shot in the rain and generally put it through it’s paces and it is still working like the day I got it. Overall, I would like to say that the D90 is a wonderful camera at a great price. I keeps up easily with the other camera’s I have used. I was sad to hear that Nikon has stopped production of this camera. I think I may have used this name already for a photo. Oh, well. Maybe I should just call it “The Barn 2”? What do you think? Any suggestions? As I am writing this, my wife was suggesting something like “barny”, “barn number 2”, “barn fever” or “another barn”. This is a sight I see every morning while driving to work. I finally stopped and took a photo. It turned out like I wanted and now I am going to begin a “Barn” series. So, should I call it “The Barn” also? Great shot. 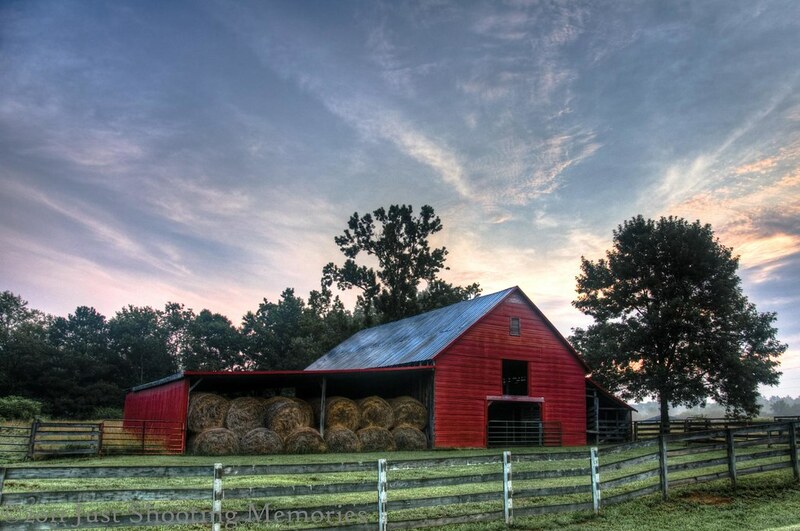 Hay bales, fence, red color, sky, it all works. I too shoot both Nikon and Canon cameras. Nikon it’s the D80; Canon it’s 50D. I like the nikon and nikkors because they focus closer and are more lightweight than Canon glass. However Canon is less expensive than my Nikon system. I too hate having to remove my eye from the viewfinder. It comes from use of any camera back in the still-film days. Back then it was easier than today. So one just copes. I like your images too nice tooling with HDR. That’s what I like to creat as well. Thanks for sharing! Thank you Brenton. I have shot Canon for several years longer than Nikon and I guess muscle memory sometimes gets in the way of learning the Nikon. But, I seem to be getting much better at it. Do you have any HDR’s that you have posted? I love to share work. Your photos are really nice. I always like the simple explanation. So “The Barn” is good or even “Barns, Here and There”. I have just started to get into the world of HDR, and recently took some photos of a barn in Michigan. Most of my HDR photos have been on the iPhone but soon to step it up a notch like these. Thank you Andy for the suggestions. I tried HDR on the iPhone 3Gs and I have not found an app that I think does an adequate job. What apps do you use for HDR? Good luck with your first steps into the wide realm of HDR. If you ever have any questions, feel free to stop by and chat. I have the iPhone 4, big improvement on the camera side, and I use the app “Pro HDR” you can see my first photo on the HDR Spotting Facebook page just below your post. It will never compare to photos like these but for $1.99 app it’s not bad. Andy, I saw your photo. Very good for an iPhone shot. Has anyone given you an invite for HDR spotting yet?